A sculpture of an eagle commemorates Pilot Officer Ivor C. Hatcher who was killed in the South West Pacific in 1943 during World War Two. Pilot Hatcher left Merauke to fly some needed spare parts to other 86 Squadron Kittyhawks based at Horn Island, flying A29-32. He never arrived at Horn Island. In May of last year when a certain air squadron was in billet in Gawler, one of the pranks of the boys, just before their departure was to remove the silver eagle from the summit of Thomson's Eagle Foundry, and carry it off to regions unknown. Some little time later, the proprietor, Mr J. J. Thomson, was acquainted of its whereabouts by a letter from the squadron, intimating that the eagle was a cherished mascot of the squadron and occupied an honored position in the Mess. 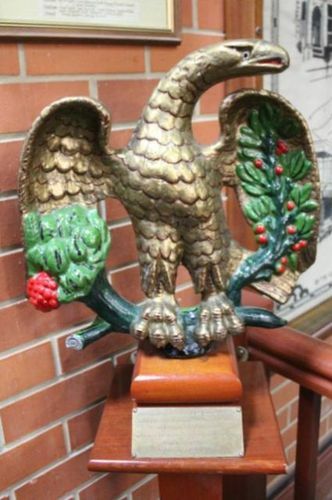 Occasionally, the boys writing to friends made in Gawler during their stay, referred to "their eagle" and it was easy to read into their remarks that the prank which had brought about possession of the mascot had grown into a sentimental part of their lives. Some told of how the eagle had figured at the head of graves of fallen comrades later to be taken back again as a cherished possession of the squadron. The eagle has since arrived back in Australia with the squadron after surviving bombing attacks, etc., during the campaign in Dutch New Guinea. On arrival in Australia it was unanimously decided by the members of the squadron to forward the eagle back to Gawler. and, subject to the original owner's consent to be kept as a token of respect and remembrance to one of the pilots, Pilot Officer Ivor Hatcher, who, as a Gawler boy will be well known to numerous citizens of that town. P/O. Hatcher was the baby pilot of the squadron and was held in very high esteem by all members of the unit. The Kadina and Wallaroo Times (SA), 14 July 1944.